For Futuropolis I created a inhabitable sculptural installation of buildings, trees, cars, boats, rockets – all designed to be drawn on by the visitors. The huge, simple, white shapes were gradually covered with detailed drawings of how the future might look. 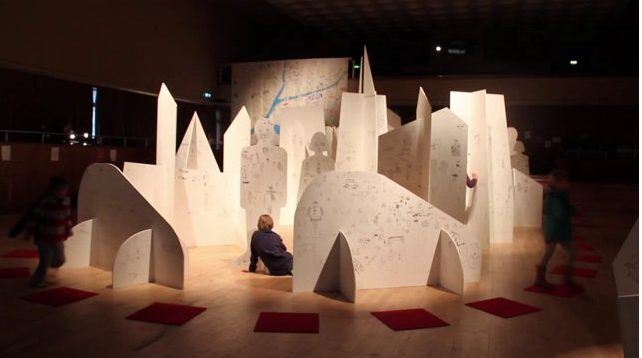 The installation was set out in the theatre auditorium against a backdrop of a giant map of an imaginary city which was created during a previous family workshop that I had led. A short film documenting the installation is at the following link: Film. I set the theme for the event by imagining that 100 years in the future the sea had reclaimed Bexhill, leaving the Pavilion at the centre of an underwater town. 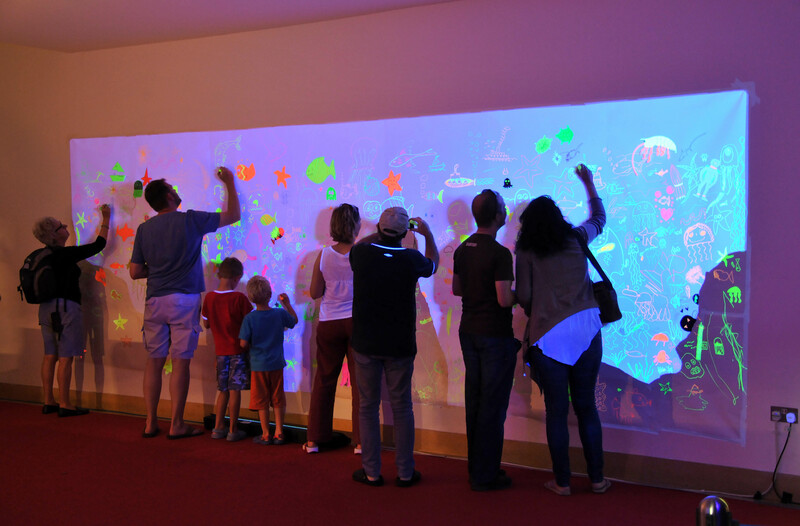 All the public spaces in the building were turned into drawing installation zones, with their own specific activity. 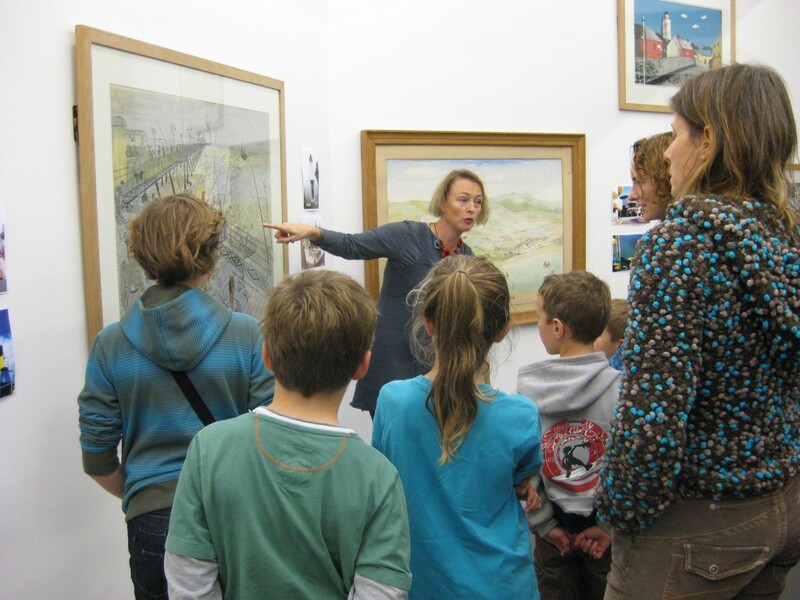 To emphasise the fact that drawing has active value in everyday life, participants were invited to combine knowledge, observation and imagination while drawing as scientists, poets, engineers, architects and artists. There were 10 different drawing zones. 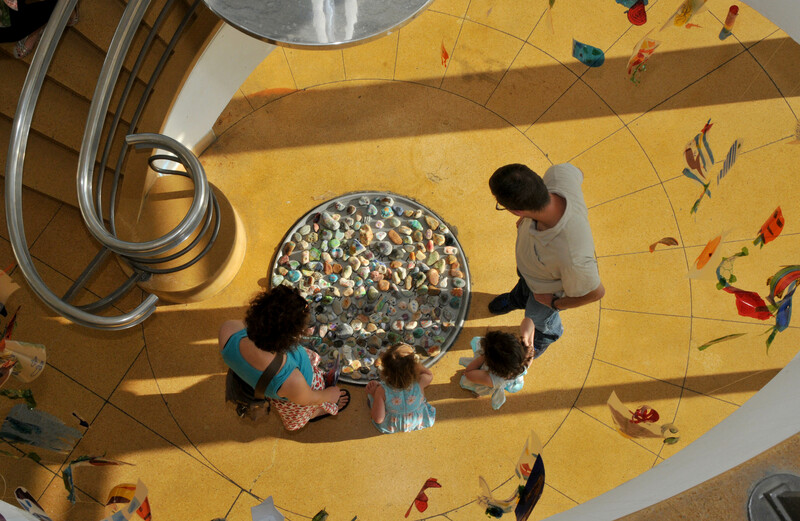 These included: designing underwater vehicles; architecture for a new town of Bexhill-under-Sea; an ultraviolet reef at the fluorescent drawing station; floating mermaids, divers, sharks and jellyfish made from coloured acetates and fishing twine; an origami fish run cascading down the staircase. For the youngest visitors there was sand sketching in a large pit and floor drawings on paper rock pools in the octopus’s garden. In May 2012 I received the Trailblazer Award from the Campaign for Drawing for the most innovative Big Draw event of 2011. The theme I chose for the event was “Walking on Water”, in which members of the public were invited to imagine how the Eastbourne pier could be redesigned for the 21st century. Inspiration for different approaches to drawing was provided by an exhibition of paintings, prints and drawings that I selected from the Towner’s own permanent collection. I interspersed these with photographs of extraordinary buildings from around the world, to show that even the most improbable structures are possible. 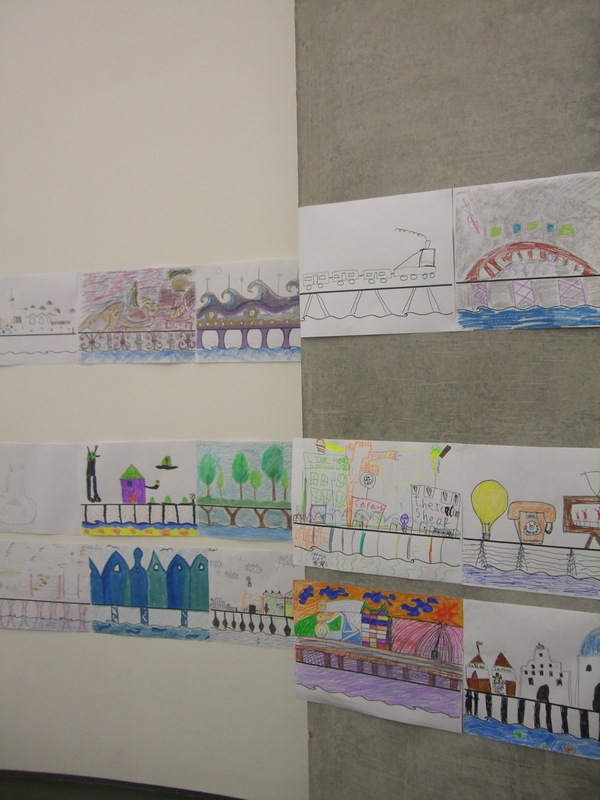 Over the course of the Big Draw weekend, several hundred colourful designs were made by the public and displayed as a continuous drawing, which wrapped around the gallery walls, three times over. I designed this event around the narrative form of the Bayeux Tapestry, as a way of recording local people and their lives. We used stylistic attributes of the original, such as: restricted colour palette; use of borders; figures posed in mainly in profile; words amongst the drawing to identify characters. I made large figure templates inspired by characters within the Tapestry for the participants to draw around. The day resulted in the creation of nearly 100 figures, set in their local environment. Following the public event, I took the figure templates into six schools, primary and secondary, to continue the concept in conjunction with their ongoing history topics. 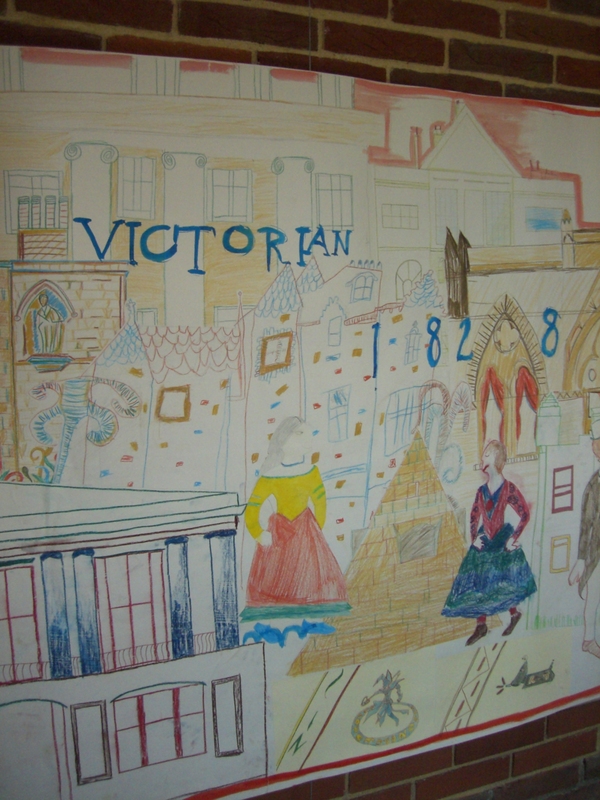 Each school created artwork around a different aspect of local history, from the Tudors right up to how Hastings was affected by WW2. 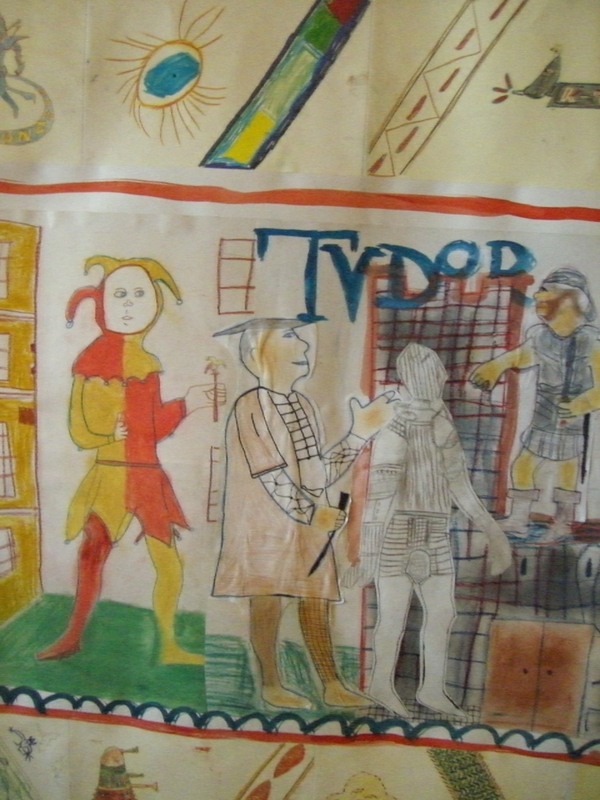 The two bodies of work, from the public Big Draw event and from the participating schools were collaged into a single work, depicting Hastings from 1066 to the present day. This gigantic “Tapestry” was exhibited at the Museum.